From my first position as a veterinarian at a zoological institution, I have been dedicated to advancing the care of captive wild animals. One of my first patients was a male lion with lymphoma, which prompted me to discover a novel method of treating his cancer. Through this process, I discovered that very little was known about cancers in wild animals and how to treat them. This absence of knowledge was disturbing, particularly with all of the knowledge that existed in domestic canine and feline medicine. Looking at dog and cat medicine only goes so far in captive zoological species. I was then driven to understand more about incidence of cancer in zoological species and therapies needed to combat cancer in them. I joined a collaboration to co-develop the Exotic Species Cancer Research Alliance (ESCRA) database with Ashley Zehnder. 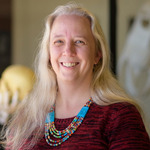 After 12 years in zoo medicine, I decided to become an assistant professor at North Carolina State University College of Veterinary Medicine to further my research into cancer in zoo animals. I have also joined with the Arizona Cancer Evolution Center to help understand cancer as part of a greater group focusing on the research of zoo animals with cancer. I am regularly treating and consulting on zoo and exotic animal pets with cancer. It is my goal to make a difference in their lives. Thank you so much! We appreciate your support!